I love working with 100% merino wool. It's buttery soft and a delight to knit up. 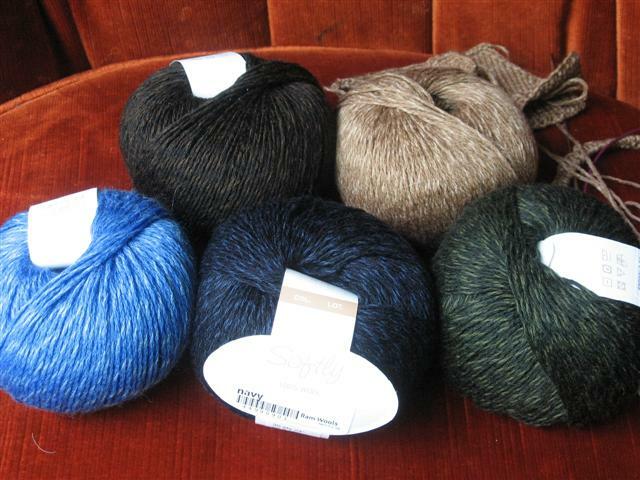 These are the colors I bought last night at the local yarn shop. 1 skein of each color in this type of wool. I took a guess and started knitting up my personal favorite of the bunch last night (tan.) I finished the sleeves and started the body of the cardigan but I think this one will be for my personal collection. K. said she prefers blue, green and purple. I haven't got purple but she can have her pick of these yarns. I will put the tan one aside and work on hers. I'd like to get at least 1 sweater finished by Tuesday. My Oliver + S patterns should be here then and my oldest has requested a dress shirt just like Dad's.